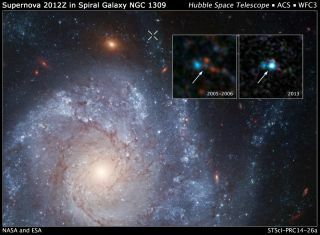 These observations from the Hubble Space Telescope show before and after views for the supernova SN 2012Z in the outskirts of the galaxy NGC 1309, 108 million light-years from Earth. Inset: SN 2012Z is seen in 2013, while data from 2005-2006 show its perceived progenitor star pair. Image released Aug. 6, 2014. The most powerful stellar blasts in the universe may not always destroy stars in explosive supernovas as scientists had thought, but instead leave behind a remnant "zombie star," astronomers say. These new findings may shed light on the origins of a mysterious kind of star explosion known as a Type Iax supernova, the researchers added. Scientists think a kind of stellar blast, known as a Type Ia supernova, occurs when one star pours enough fuel onto a dying companion star, known as a white dwarf, to trigger an extraordinary nuclear explosion. However, researchers have never actually seen what stars actually give rise to these outbursts, thus making their origins uncertain. "Astronomers have been searching for decades for the progenitors of type Ia's," study co-author Saurabh Jha, an astronomer at Rutgers University in Piscataway, N.J., said in a statement. "Type Ia's are important because they're used to measure vast cosmic distances and the expansion of the universe." This past data helped researchers discover the apparent progenitor of the supernova. The likelihood the star they detected is related to the supernova is more than 99 percent, they said. "We were tremendously excited to see a progenitor system for this supernova," lead study author Curtis McCully, an astronomer at Rutgers, told Space.com. "No one had ever seen a progenitor system for a white-dwarf supernova in pre-explosion data, so our expectation was that we wouldn't see anything. Nature surprised us, which is always exciting." The researchers had expected that the supernova's progenitor system would be too faint to see, as was the case with previous searches for type Ia supernova progenitors. "I was very surprised to see anything at the location of the supernova," McCully recalled. SN 2012Z was actually a mysterious kind of exploding star known as a Type Iax supernova. First recognized 12 years ago, Type Iax supernovas were originally thought to be fainter cousins of the more common Type Ia supernova, but they now seem to be a related but distinct class. So far, astronomers have identified more than 30 of these unusual Type Iax supernovas, which occur at a rate of about one-fifth that of Type Ia supernovae, but release only between 1 and 50 percent of the energy. The astronomers found that the progenitor system of SN 2012Z apparently consisted of a white dwarf and a bright-blue companion star. The researchers suggested the companion is a "helium star" whose outer shells of hydrogen have been stripped away, leaving only its helium core. "Our results show that at least some white-dwarf supernova explosions arise from a white dwarf that accretes material from a luminous companion star," Jha told Space.com. Instead of destroying the exploding star — as supernovas are often thought to do — SN 2012Z may have left behind a battered and bruised white dwarf, which the researchers called a "zombie star." "There are indications that the white dwarf may not have been completely disrupted," study co-author Ryan Foley, an astronomer at the University of Illinois at Urbana-Champaign, told Space.com. These findings suggest that Type Ia supernovas may have different origins than Type Iax supernovas. For instance, before and after images of Type Ia supernovas like SN 2014J and SN 2011fe would have been capable of revealing any blue progenitor system if one existed. However, none was seen. "It certainly seems like most normal Type Ia supernovae cannot have a luminous blue companion star like in the case for this Type Iax supernova," Jha told Space.com. Instead, this Type Iax supernova resembles a nova star explosion — a much-less-powerful stellar blast — called V445 Puppis, an explosion in the Milky Way that astronomers detected in 2000. Novas are like Type Ia supernovas in that they occur when white dwarfs accumulate fuel from a companion star, but novas do not completely destroy their stars like supernovas are thought to do. The researchers added that the progenitor system V445 Puppis nova is thought to consist of a white dwarf and a companion helium star, maybe just like SN 2012Z. One possible scenario for this system the researchers modeled is that it originally consisted of two stars — one weighing four times the mass of the sun, and the other seven times the mass of the sun. The stars began exchanging hydrogen and helium fuel back and forth, with the larger star eventually dwindling to become a white dwarf about the mass of the sun, the researchers suggested. The blue companion star, in turn, swelled in size and shed its outer layers, until it became a helium star about twice the mass of the sun. The white dwarf then siphoned matter from its blue companion until the extra fuel made it explode as a Type Iax supernova and blow off about half its mass, instead of completely dying, the researchers explained. However, the researchers acknowledged that they cannot yet rule out other possibilities for the identity of the blue star they saw. For instance, it could have been a massive star 30 to 40 times the mass of the sun that destroyed itself when it detonated. To settle the question once and for all, the researchers "will get future observations of the system in late 2015 with the Hubble Space Telescope after the supernova light has faded," Jha said. There are two possibilities: Either researchers will see no star at all, as would be the case if the supernova's progenitor was a massive star, or a helium star will be there "but it will have changed due to the explosion," Jha said. "We also hope to see the remnant zombie star," Jha added. The research is detailed in the Aug. 7 edition of the journal Nature.